In my home campaign my group decided at the DM's encouragement(me), that the easy way to deal with diagonal movement of 3.5 and Pathfinder RPG was rather than calculate 1.5 per diagonal square or do the 1-2-1-2 movement suggested in the handbooks, to just count diagonal movement as 2, period. While it might not be the best alternative or accurate (this is just a game, not a real life simulation right!? ), it works for us and it functions on a two way street for both players and npc/monsters. We continued the practice after our conversion to Pathfinder RPG. I would encourage you to do whatever works best with your group. You might even opt out of a "grid movement system" entirely and go with a straight length calculation. If you choose this method I would suggest that you pick up some "soft" yard/meter sticks from the fabric store or make them yourself! You can easily craft a measuring device with some white shoelaces and a sharpie, but that tutorial with have to wait for another article. All three of the game systems use movement rules that primarily deal with movement while in combat or as its called Tactical Movement. Outside of combat, movement is generally calculated abstractly with various modifiers such as environment conditions, fatigue, etc. This movement outside of combat is usually calculated in how far a character can go in a day and is used for traveling long distances also called wilderness travel, overland travel, or oversea travel. Think of this movement as when Bilbo, Sam, and Gollum when taking the one ring to Mordor. Tactical movement is more akin to the fight the fellowship had within Balin's Tomb with the goblins and cave troll. The three systems all also use a grid system of 5 ft. x 5 ft for Tactical Movement. The height of a 6 ft. tall character is the equivalent to 30mm. In DnD 4.0 it states 32mm for a 6 ft. tall character At this rate we'll be playing with Hasbro figures! Hey wait a second who owns Wizards of the Coast! A side note; in previous versions of DnD 28mm was the norm or smaller, but in general the old mini castings of the 70's pale in comparison with the miniatures that are produced today. Though I do have a fondness for some of my 80's miniatures. I find 28mm is the scale I like the best for both cost and convenience of play. Larger just means more money per figure, more space needed for storage, and some mini's can get absurdly proportioned. 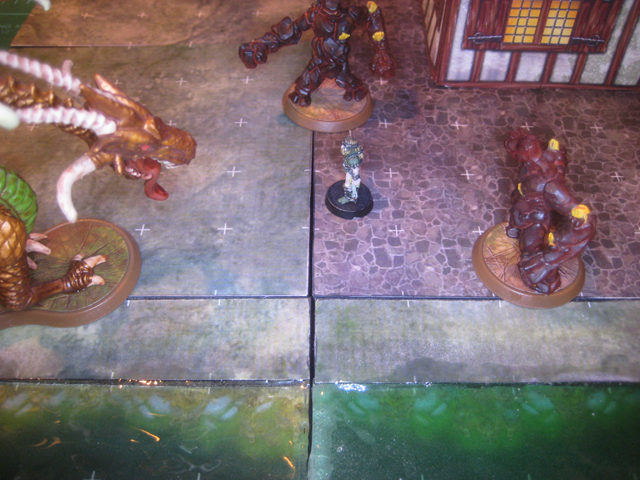 I'm betting that the move to yet a larger 32 mm scale was to incorporate the DnD miniatures collectible gaming line. There isn't much difference in the general movement rules between the three systems to be perfectly honest. In fact you would be hard pressed to see any difference between DnD 3.5 and Pathfinder RPG movement rules, which makes the progression to Pathfinder that much easier. One of the big differences between DnD 3.5 and Pathfinder RPG has to do with Pathfinder's introduction of the Combat Maneuver System. The Combat Maneuver Bonus (CMB) and Combat Maneuver Defense (CMD) of Pathfinder greatly simplifies, to our benefit, some of the special attacks involving movement such as Bull Rush, Charging, Tripping, etc. For example in Pathfinder RPG each participant rolls a d20 and then applies their CM scores. The character doing the action uses their CMB, while the character who the action is being performed on, uses their CMD. Whoever is higher wins out and the action is performed if its a tie the action goes to the defender. DnD 4.0 Handles these situations with straight up actions. For instance someone performs a Grab action on you and if they score a "hit" you're grabbed. Only then can you use your Escape Action to get free and move away. There doesn't appear to be anyway to prevent the action or comparison rolls like in Pathfinder RPG. All three systems retain the "Attacks of Opportunity" (AoO) system, so if you exit, travel through a "threatened square" or perform an action, like spell casting, in an adjacent square to an enemy you'll provoke an AoO. It might be something to note that each monster or character can only make one AoO each round unless they have an ability that allows for more if they present themselves. DnD 4.0 does have a few changes but typically they are made to simplify the rules. One example where the rules were simplified in DnD 4.0 is the removal of a few of the size categories. No longer do you have diminutive, fine, and colossal size categories to consider in movement. Another big change is that DnD 4.0 eliminates any extra movement for diagonal movement, in 4.0 it now only costs 1 movement per 5 ft. x 5 ft. square regardless of your movement path. 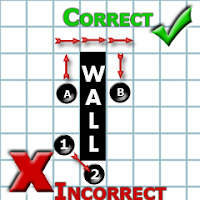 They do continue to include the rule that you cannot "cut" a corner of a wall(see diagram). For example if a square is completely filled with an impassible object, typically a wall, you can't move diagonally, you'll still have to go around the long way. If its a creature you can get by diagonally because they don't completely "fill" the square. Another big change in matters of movement in DnD 4.0 are with the addition of Push, Pull and Slide actions. Mostly those actions come from powers, abilities, magic items, etc. A perfect example is the bull rush action which still has a "displacement effect" now called Push. Abilities, powers, magical items, that allows you push, pull or slide something will have a number which represents the number of squares that the action is performed. That is to say,the bull rush action provides 1 Push where as you push the target from their location and you slide into the vacated space. It seems that more or less they cleaned up the displacement rules from previous editions and included rules that allowed for spells and abilities to fling things about on the combat map much more. Lastly DnD 3.5 and Pathfinder RPG still use the 5 ft. step rule where you can perform a 5 ft. step without provoking an AoO if you didn't move in the round thus allowing you to move away from or further into combat. DnD 4.0 renames the effect to a "Shift Action" but essentially its the same function, but as with all things DnD 4.0 looks like it can be added to things, abilities, powert, etc. Well that's pretty much everything regarding movement that I have at the moment.